In Nigeria’s Delta State, the UN is funding schemes to supply electricity to rural areas using waste gas usually burnt at oil wells. It’s already past nine pm in Umudu, a rural community in Nigeria’s oil-rich Delta state, but it looks more like three in the afternoon. Chris Ejiofor, a farmer has just had his supper and sits outside the family home, staring with disdain at flares of burning gas which provide the illumination. The intense glare and heat come from the oil and gas site at nearby Ebedei. The flares are not the only blight. The land and water is also polluted by oil from leaking pipes. “The burning never stops, and besides affecting farmlands near and far, it gives off so much heat that it makes us feel ill,” says Ejiofor, “The rainwater is also polluted because any time it falls, everywhere is soiled with something looking like a mixture of water and charcoal.” Ejiofor, like his neighbours, has no electricity and so far feels he has seen little benefit from the oil wells on his doorstep. In theory, burning or ‘flaring’ the waste gas produced when oil is pumped from a well was supposed to stop in Nigeria in 1984, but oil companies have been granted exemptions year after year, allowing them to continue the practice. 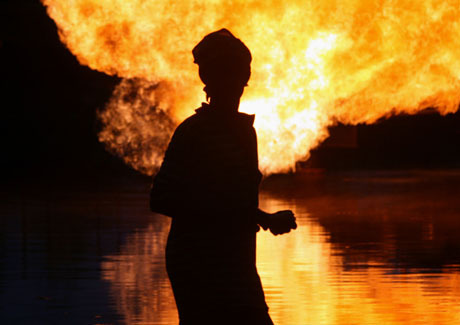 Estimates say Nigeria accounts for 13 per cent of the gas flared worldwide. A ban that was supposed to take effect in 2009 was deferred, with the new deadline now set for December 2012. Oil operators say they are committed to phasing out flaring – Platform Petroleum, for example, which operates in Ebedei announced recently it will meet the government deadline – but most oil companies agree the exercise is costly and will take time. The UN is putting money into what it hopes is a winning compromise. With funding from the UN’s Clean Development Mechanism (CDM), schemes to capture and use this waste gas are to be introduced in two of Delta state’s oilfields, Kwale and Ovade-Ogharafe. These ‘gas utilization schemes’ include plans to supply electricity to rural areas. The project will process hitherto flared gas to generate electricity and the carbon credits earned by cutting greenhouse gas emissions will be sold abroad. Most likely to industrialised countries to help them meet emission limits. “The CDM registration has taken more than four years of effort… The credits will be sold to Nuon, the Dutch state utility, so that the carbon emission reductions that occur in Nigeria will help the Netherlands meet its obligations under the Kyoto Protocol,” says Chief Festus Fadeyi chairman of the Pan Ocean Oil Corporation, a Nigerian oil and gas company. The Pan Ocean scheme is the largest CDM project in Africa, predicted to cut emissions by an estimated two million tons of carbon dioxide (CO2) annually. It appears however the projects will not utilize the large amount of associated gas produced – so gas flaring will not be entirely wiped out. Prompting critics to complain that continued flaring violates the rights of local people and should not earn anyone a profit. Another project funded under the clean development mechanism initiative is the SAVE80; a fuel efficient wood stove that aims to slow the rate of deforestation, particularly in Nigeria’s dry north. Because of the encroaching Sahara desert, housewives like Fausat Abdulahi, in the village of Birnin Ganye in Bauchi, have to go further to get firewood to cook their meals. Fausat Abdulahi’s family is growing, with more mouths to feed, but desertification means less available wood. “My mother-in-law whom I usually turn to at such a period passed on last week,” she says, close to tears. She is getting heavy with her unborn third child and times are hard, especially for those who can’t rely on their families to help out. Each SAVE80 system (a stove and a heat-retaining box) needs around 80 per cent less wood than traditional stoves and is expected to save 2.72 tonnes of CO2-equivalent per household each year. It is aimed at housewives like Fausat, reducing the amount of firewood she needs and helping to cut the toxic indoor cooking smoke. The whole project is expected to prevent the emission of 300,000 tonnes of CO2 by 2019. Nigeria’s Environment Minister, John Odey, is proud that these projects will earn Nigeria more carbon credits than any other African nation. But what of the gas flaring which causes Chris Elfior and his neighbours so much distress? Critics have claimed that by failing to stop the gas flaring outright, the government is trading with peoples’ lives to please the oil majors. The UN’s Nigeria CDM project outline says ‘it is difficult to envisage a situation where wholesale changes in practice in venting or flaring, or cessation of oil production in order to eliminate flaring will be forthcoming in the near term.’ Nigeria, at the COP 15 in Copenhagen was much more upbeat, with officials announcing the clean development mechanism projects offered “a beacon of hope to gas flaring history in the country.” With the latest deadline nearly three years away, only time will tell. Michael Simire is Environment and Homes Editor with Independent Newspapers Ltd in Lagos, Nigeria. He wrote this article thanks to a fellowship with the Climate Change Media Partnership – an initiative of the Panos Network, Internews and the International Institute for Environment and Development (IIED). i feel for the people living in the communities near the gas flaring site.over five decade of watching the flared gas wreaked havoc to their source of livelihood.o mashe.